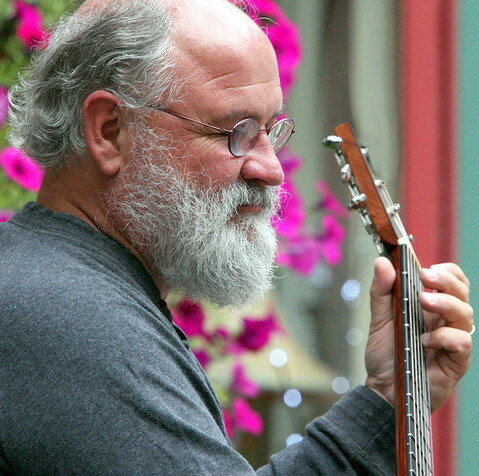 Down East musician, Bob Bowman, has long been respected for his guitar, mandolin, and banjo work as a soloist and with groups in Maine and Canada. His intricate solo guitar arrangements of centuries-old Irish harp and fiddle music, familiar jazz and pop standards of the ‘30s and ’40s, and original compositions appeal to audiences of all ages and tastes. Bob has arranged and recorded music for PBS, National Geographic, and several independent filmmakers. He typically gives more than 200 live performances a year. Bob and his wife, Cate, a teacher, divide their time year-round between a home in New Brunswick, Canada, touring the country in the winter, and nightly performances throughout the summer on Mount Desert Island, Maine. Along with being a life-long musician, Bob has been a ferry captain, boatbuilder, marine biologist, and the owner/operator of one of the first North Atlantic whale watching companies, Maine Whalewatch. He’s led field studies on endangered whales in the US, Canada, Mexico and the Dominican Republic. In response to unsustainable rates of large whale mortality and serious injury in US and Canadian commercial fisheries, Bob created federal emergency assessment and response protocols centered upon fisherman participation. He designed and distributed specialized tools, including satellite tracking systems, and launched a disentanglement training program and professional website to inform and support a network of hundreds of commercial fishermen, scientists, government agencies, and marine professionals around the world. The Atlantic Large Whale Disentanglement Network, which Bob coordinated through the Center for Coastal Studies, became an international effort encompassing 20 federally authorized response teams from Florida to Quebec. Bob has published in scientific journals, presented papers at international scientific conferences, and lectured widely, including travels to South Africa and Australia at the invitation of those governments to advise the creation of national whale disentanglement programs and to train their teams. His work has been instrumental in setting worldwide standards in this highly technical and dangerous field and in saving the lives of hundreds of endangered whales. Bob's gear includes a very high quality battery-powered PA system that is especially useful for outdoor events. For large venues and groups (up to 500), Bob has assembled an innovative wireless sound system through which he transmits to multiple professional-grade speakers and/or to a venue’s existing background music system -- providing low-volume, well-distributed sound in multi-room and indoor-outdoor settings. Eliminating cables makes Bob’s set-up compact and uncluttered. Sound equipment is included in Bob's performance fees, and is also available for rental. Bob Bowman is available for both public and private engagements. Pricing is affordably tailored to your event.